If you haven't read a Sammy Keyes mystery before, what are you waiting for? You might want to start with her Edgar Award-winning first mystery, Sammy Keyes and the Hotel Thief, but reading any of these books is fun and a good mystery to boot. In the Dead Giveaway, it is the end of Sammy's 7th grade year, and she's got a lot on her mind. Sammy has been walking Mrs. Willawaw's dog as a favor after school. She then finds out her house is getting bought out by the city so they can put in a new recreation center, only Mrs. W doesn't want to sell. Sammy also accidentally causes the death of her homeroom teacher's lovebird and witnesses her archenemy, Heather, stealing ballots for the popularity contest. Add in a looming first date at a dance, and Sammy has more than she can chew in one sitting! As always, Sammy may make some mistakes, but she is great at solving mysteries. She ends up meddling in politics, learns confession is good for the soul, goes one up on Heather, and finds a first date isn't quite as awful as she imagined it would be. If you have read some of her other books, you'll be more familiar with the history with some of the characters, but it isn't necessary. 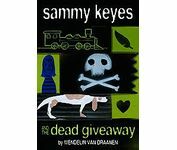 A good, fun mystery that readers will be sure to like.Read more about Sammy Keyes, the Shredderman series and the author at the Wendelin Van Draanen site.